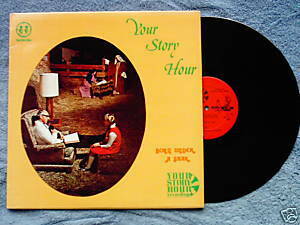 Your Story Hour Recordings 37383. Born Under a Star. 1976 LP includes Uncle Dan and Aunt Sue telling the story of Christ's birth, and a trilogy of true-to-life dramas "Fantastic Christmas", "Sam and the Christmas Angel" and "Lori's Just for Love." Performed by Stanley H Hill and Betty Hausted Ahnberg, "the family's favorite story tellers". Recorded in Medina, Ohio. Vinyl is VG/VG; cover with photos is VGwith minor corner wear.